The Jabra Engage 50 features USB-C connectivity and USB-A connectivity via an accessory. Jabra has launched its new Engage 50 digital corded headset in India. The device is said to help improve call quality and employee productivity to raise customer satisfaction. 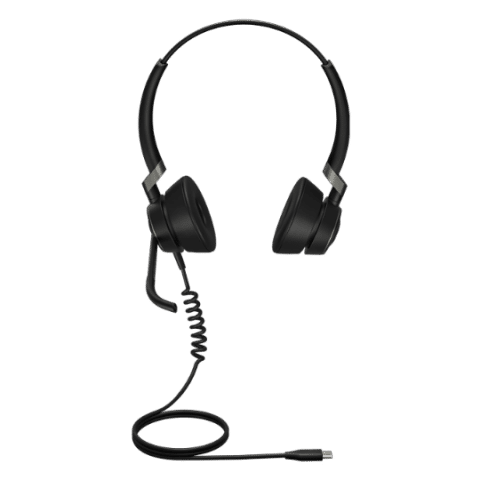 It features a 3-microphone system that is said to filters out background noise and breathing sounds and it's also compatible with on-premises and cloud-based softphone platforms. The Engage 50 comes in Stereo/Mono configuration and is priced at Rs 23,730 and Rs 21,470 respectively. Jabra is launching the Engage 50 – a professional digital corded headset that sets new standards for call quality and employee productivity to raise customer satisfaction. Jabra has engineered the Engage 50 to solve the problems facing customer service-led organisations, with recent studies saying that 73 per cent of agents find that noise has a negative effect on their productivity. Specifically designed for softphone environments, with features that combat noise and interruptions in the contact centre to drive customer satisfaction, the Jabra Engage 50 features a unique 3-microphone system that filters out background noise and breathing sounds, giving callers a superior experience. Stereo sound and super wideband enable vibrant, lifelike conversations – with the highest levels of hearing protection for agents. The Jabra Engage 50 is compatible with on-premises and cloud-based softphone platforms. The Jabra Engage 50 headset uses specially-designed software to provide rich call analytics to power data-driven decisions to improve the customer experience, whilst combating the agent’s key pain point: noise. When using the Jabra Engage 50 the user gets live on-screen guidance via the Jabra Direct software to adjust the microphone boom arm if it’s not placed in an ideal position and should be adjusted to deliver the best call quality to enhance the customer experience. With the Jabra Express software, the business can get an overview of the data for individual users or groups. For instance background noise measurements give companies an indication of areas or time periods where noise is above a certain threshold. This allows the business to make data-driven decisions to reduce noise and enhance productivity. The headset also addresses the issue of interruptions that affect agents’ work focus, thanks to multi-colour status lights on both earcups. These lights can be customised for the needs of the business, ensuring that users are never bothered while in the middle of an important call. Impressive passive noise cancellation further guards against interruptive ambient noise and improves agents’ ability to focus. The Engage 50 headset holds three patents for features that improve call quality: its 3-microphone system to reduce unwanted sounds, embedding the processing chip directly in the earcup, and the audio improvements that balance the incoming sound and automatically adjust to the users’ preferences. Further to these patents, Engage 50 features a call control unit accessory, the Jabra Engage Link, that allows agents to adjust volume levels and mute, speed dial, answer and end calls, and update their status lights at the touch of a button. Meanwhile, each headset incorporates category-first USB-C for easy connection to PC and mobile devices, with the option of USB-A connectivity as an accessory.